A Gauteng school equipped with a smartboard. 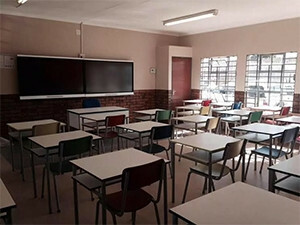 Some 375 high schools in Soweto are expected to go digital, as they switch from chalkboards to smartboards tomorrow, says the Department of Education. Earlier this year, the Gauteng Department of Education (GDE) launched phase one of the "paperless classroom", which saw seven schools in the province move from using traditional learning tools to smartboards and tablet devices. The first phase included infrastructure upgrades and re-equipping school buildings, and the preparation of classrooms for the installation of the technology. According to the department, the seven schools were provided with high-speed broadband connectivity, laptops, tablets, interactive electronic screens (e-boards) and e-content. GDE spokesperson Phumla Sekhonyane says the additional 375 schools that are going digital form part of the department's second phase of the "paperless classroom" project. The second phase entails helping national senior certificate learners acquire confidence and pleasure in using new technologies to learn, solve problems, develop critical thinking skills and communicate ideas, says Sekhonyane. According to the department, it has purchased over 17 000 tablets for the Grade 12 learners, and 1 800 3D LED interactive boards. "Smartboards are currently being installed in 375 schools, and will be utilised effective 21 July, in an effort to enhance lessons, motivate learners, increase interaction, encourage involvement of students in the subject, and increase student achievement through enlivened presentations," she says. Graeme Bloch, education analyst at Wits University's Public and Development Management School, says the department's move is a good start, but not enough. "We need to go with technology, but technology cannot be a magic bullet to all the problems in schools," he says. Following the first phase of the "paperless classroom", a spate of burglaries forced the department to withdraw tablets handed over to schools in the province. According to the department, of the 88 000 tablets handed over to learners, more than 3 000 had been stolen. Sekhonyane explains tracking devices have been installed in the tablets they withdrew from the schools and says the department is prepared this time around. "We have beefed up security at schools, but also mobilised community structures to defend this investment. We have also activated the security cluster to be part of this process," she says. ICT veteran Adrian Schofield says the GDE's move would be a better initiative if it was part of a holistic approach that changed teaching methodologies, the teaching culture, the curriculum and the measurement of learner progress. "There are harsh lessons (for the bureaucrats as well as the pupils) to be learned from the early theft of the tablets, which resulted in the withdrawal of the scheme. Using a tablet as the pupil interface is more complex than replacing a pencil with a ballpoint or a slide rule with a calculator," he says. Schofield notes digitising the schools is not enough but it is one element in the revamping of the country's education system that is desperately needed. The GDE wants all Gauteng learners in no-fee-paying schools to each have a tablet device for educational purposes by 2017.